Stuart Nielsen began his career as a painter in the 1970's. His large abstract, patterned and eccentrically shaped paintings on fiberglass, a process he pioneered, were widely collected and exhibited. The imagery, pattern, and in particular the architectural scale of these paintings lead to opportunities for commissioned projects in public spaces. The two-dimensional work soon evolved into three-dimensions and since 1979 Nielsen has created some 20 site-specific sculptures; indoor, outdoor, public and private, in a variety of media ranging from wood and stone to metals and plastic. 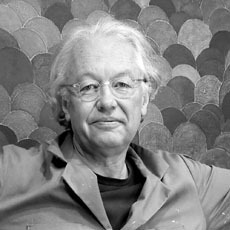 He has collaborated with architects and designers and has been an advocate for art in public places. In the last three years Nielsen has moved away from commissioned projects and returned to studio work and large paintings. Additionally Nielsen has, over the years, created a number of print editions and multiples, including the recent portfolios Cardinal Suite and Winter Hours.